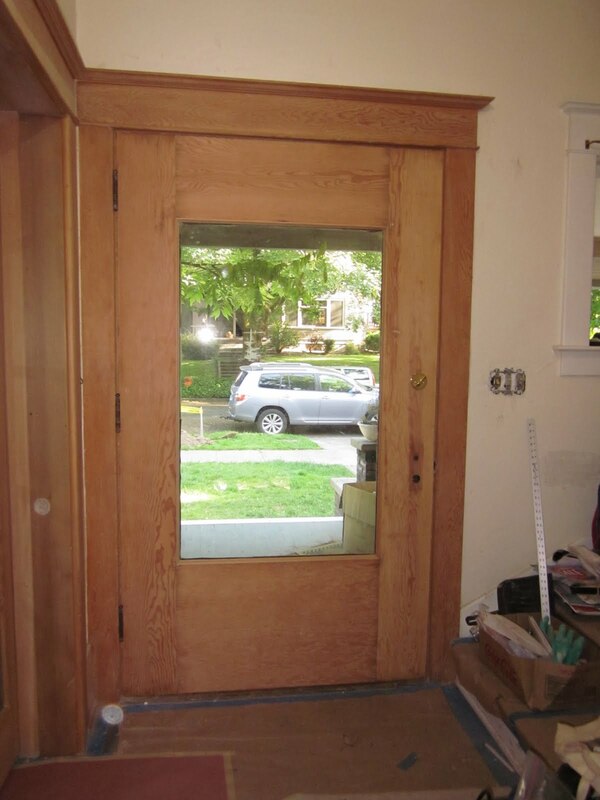 Laurelhurst Craftsman Bungalow: Front Door Stripped! Today Sharon finished stripping the front door! After she found a very similar fir moulding to what was on there, she decided not to invest the time stripping the chewed and painted moulding. We went to Woodcrafters this morning and bought replacement pieces and got some help this afternoon installing them. Sharon never would have sanded down the front side had she realized it was purple stain! Doh! So, she didn't obsessively try and strip everything and we'll go ahead and apply another, somewhat lighter, purple. We went this morning and bought another wavy glass window at the Rebuilding Center in our attempt to replace the glass in the dining room window. It was such gorgeous wavy glass; it was probably very old. But, unfortunately, the glass was so brittle that it actually broke before we could even remove the glazing. Sigh. It's more satisfying to use old salvaged materials, but this is getting silly. We'll probably try one last time to salvage old glass and if that doesn't work, then we'll just break down and buy modern restoration glass.